Repeat all steps 4 times. Take 60 second pauses between laps. This workout should take about 40 minutes to complete it. Try this interesting workout at your gym. Take a dumbbell in each hand and sit on a flat bench. Raise the dumbbells to head height (palms facing out). Put the elbows out. With no leaning back, extend through the elbows to raise the dumbbells together directly above your head. When you do the movement, curl the wrists so that at the top position you are holding the dumbbells with palms facing each other. Pause for a second. Slowly return the dumbbells to the starting position and repeat the exercise according to the training plan. Place the aerobic steps next to you and go down in a push up position. Place your feet together. Your hands should be just inside the steps. Bend your elbows and lower your body. Keep lowering yourself until you touch the floor with your chest. Quickly reverse the movement to push your body of the floor. As you leave the floor, move your hands onto the steps, bending your elbows to absorb the impact. 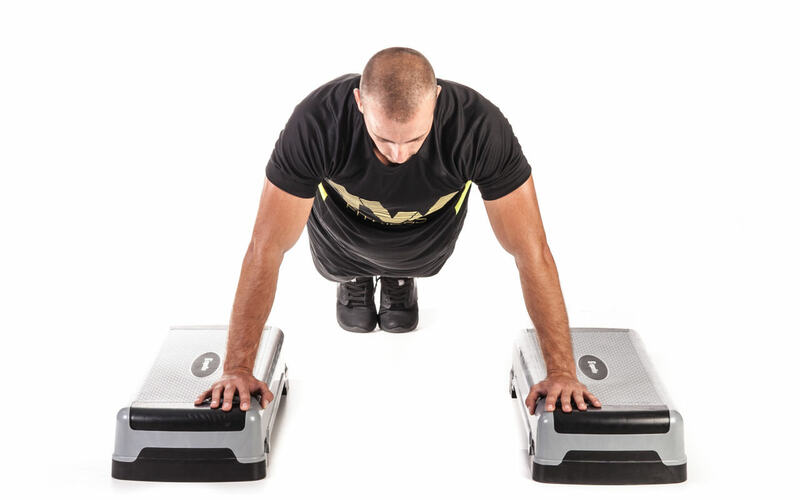 Bend your elbows and do deep incline push up. Lower yourself between two steps as low as you can. Extend your elbows and put your body in a straight line. Repeat the motion to return to the starting position. Repeat the exercise according to the training plan. Hold the H-bar at arm’s length (you can do this exercise with regular barbell). Bend your knees slightly and bring your torso forward by bending at the waist. Make sure to keep your back straight until it is almost parallel to the floor. While keeping the torso stationary, lift the bar toward your abs, keeping the elbows close to the body. On the top contracted position, squeeze the back muscles and hold for a second. Slowly lower the bar to the starting position and repeat the exercise according to the training plan. Place the bar on a back of your shoulders (slightly below the neck). 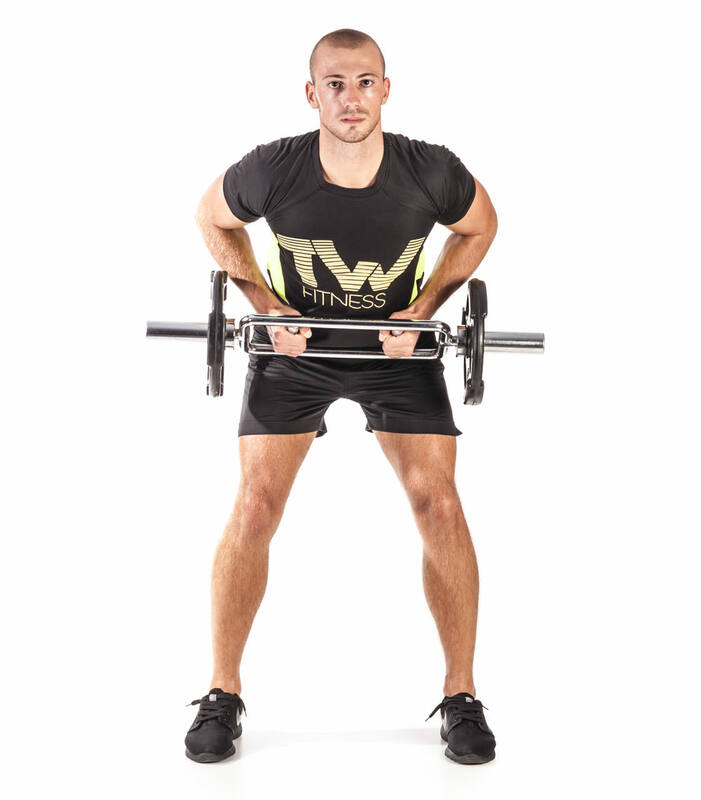 Hold on to the bar using both arms at each side (pronated grip). Step forward with your right leg and squat down through your hips, while keeping the torso upright and maintaining balance. Keep lowering yourself until your front thigh is parallel to the floor. 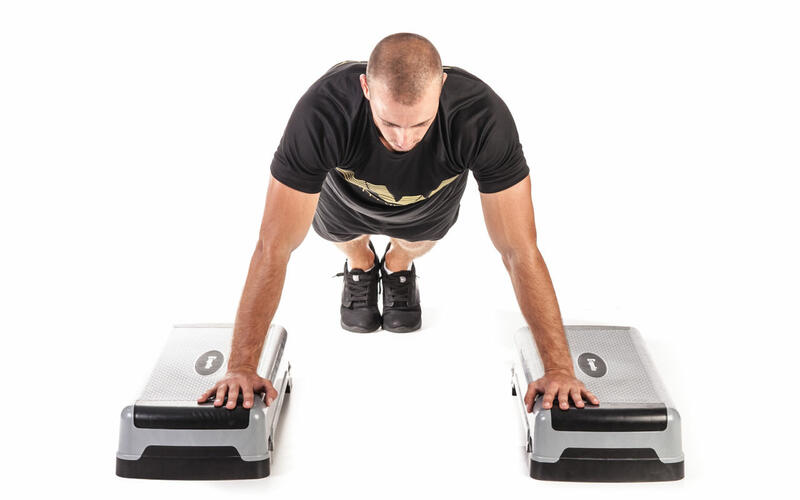 Using mainly the heel of your foot, push up and go back to the starting position. Repeat the exercise stepping forward with your left leg. 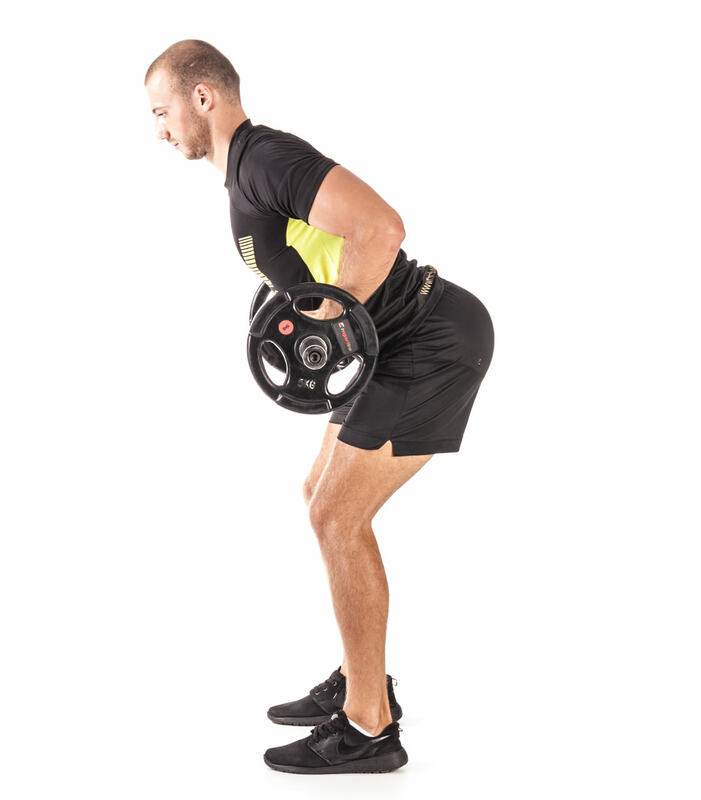 Go back to the starting position and repeat the exercise according to the training plan alternating legs. Grab a pair of dumbbells. Lie on your stomach. Place the dumbbells above your head holding it with your extended arms and palms facing the floor. 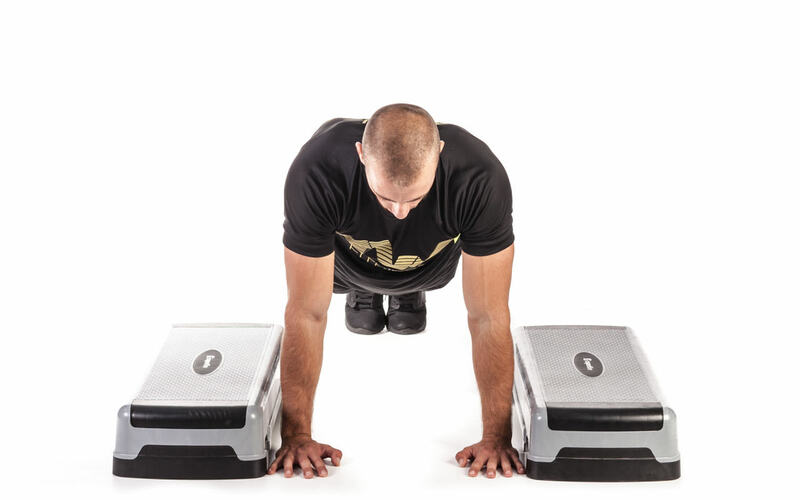 Raise your chest and arms a few inches above the floor. Draw the dumbbells to the side and remain in this position for a second. Your elbows should be bent forming a sharp angle between forearm and upper arm. Extending the elbows, push the dumbbells forward. Slowly lower your torso and arms back to the starting position. Repeat the exercise according to the training plan. Lie on the floor with your knees bent. 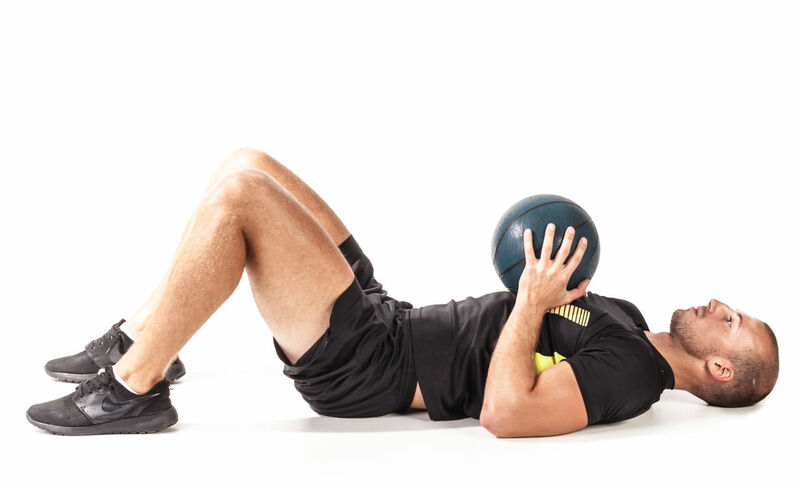 Hold the medicine ball in front of your chest. Crunch your body up and lift the ball up and forward until you touch your knees with the ball. Go back down to the starting position, releasing through the core and returning back flat against the floor. Repeat the exercise according to the training plan.